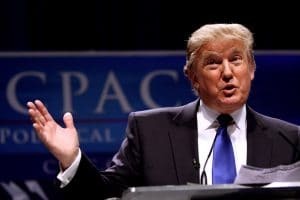 The US President, Donald Trump was a businessman and a television personality before joining politics. Donald Trump’s father, Frederick Trump was an American Real Estate developer who when became the Chairman of the board in 1971, promoted Donald Trump to President of the Company and renamed it The Trump Organization. 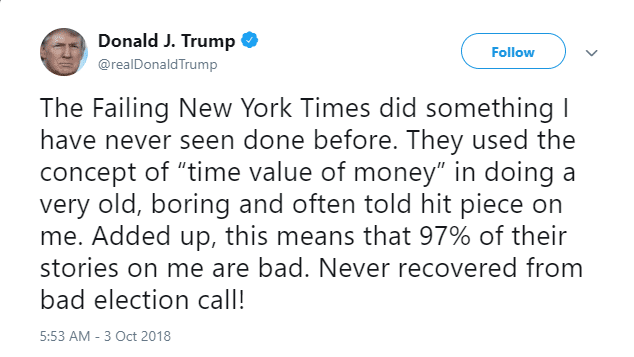 The President is always known for bragging himself as a self-made billionaire but according to the New York times investigation he received a minimum of today’s equivalent $413 million and most of it from the tax dodges in the 1990s. Trump proclaimed himself to be a self-made billionaire, to ultimately result in becoming the US President and adding that his father had no hand in providing financial help. But The Times found out that most of this money came through suspicious tax schemes he participated in the 1990s, including some frauds. Fred Trump, the President’s father, transferred over $1 billion worth of assets to his children that could have generated a tax bill of minimum $550 million. He constructed a well-detailed web of the vehicle to get rid of income taxes, estate taxes and gift taxes with the help of his children. Taking the advantage of tax code’s exceptions to avoid taxes, they paid $52.2 million producing invoices with fake charges and numerous scams. They hid their transactions with shell companies, created invoices with fake charges, undervalued properties resulting in many frauds. The Times article has documentary evidence, having his signature on them all showing that he was an active participant in the scheme of shell companies owned by him. Trump has straightaway refused to release his tax returns for examination. They have committed tax fraud on a very large scale escaping from millions of dollars that they owed to the federal government. New York Times got hold of documents that included business records, bank records and tax returns. During his live Townhall, Trump was found saying that his father helped him solely “a small loan of a million dollars”. On the basis of these facts, it looks like the President of the United States has committed numerous crimes. Trump is not the self-made man that he claims to be, he is instead an heir who is thankful for his father’s fortune. This could be a major drawback to his political outlook. Neither will he be ever condemned for all of this because the law of limitations has expired. The Times article has complete documentary evidence on the basis of which they can file a civil case against Trump. This could lead him to pay all the taxes that he evaded, plus fines. The investigations also include all his confidential records like invoices, financial disclosure reports, civil court files, regulatory records, mortgages and deeds, bank statements, accounting ledgers, financial audits, and canceled checks. Though the records hold only Fred Trump’s records and not that of Donald Trump’s. The Trump family dodged hundreds of millions in gift taxes by delivering tax returns that undervalued the properties. The Times documented 295 streams of revenue that Fred Trump created for five decades to make his son Rich. Trump has now proved that he is not capable of keeping promises to the middle class. The Trump tax scam would lower the tax rate for wealthy people and phase out other provisions. So this is beneficial for only the wealthy and nothing that benefits the middle class. The Republicans have planned to continue using the same secretive process they tried to use for health care. The stakes are just as high and the Trump tax scam will take the same level of effort. The questions will be never ending until the facts are known and it has to be investigated by Congress. Trump’s political standing is now questionable to many and most importantly, there is now a very strong evidence that the US President has committed a series of crimes.